At METALCON, learn from a series of educational courses and programs to gain the cutting-edge knowledge, sophisticated tools and advanced techniques to help ensure your business success, regardless of your niche. Athena Institute changes service life of metal roofing to 60 years! A recent MCA study of the service life of unpainted 55%Al-Zn low slope standing seam roofing has had an impact on the Athena Sustainable Materials Institute. The report served as the technical substantiation for Athena to change the useful service life of this type of roofing product to 60 years! Athena’s software allows for whole building LCA assessment, taking into account all materials, systems, assemblies and components used in a given type of building. The use of spray polyurethane foam insulation on single skin metal panels is being studied for wall and roof assemblies. A research project to evaluate the detrimental effects on metal was proposed with the Spray Polyurethane Foam Alliance (SPFA) and with the Metal Building Manufacturers Association (MBMA). Issues such as oil canning from the exothermic curing of the foam and related elevated temperatures is one such item to evaluate. Other concerns are centered around potential damage to paint films. As a collaboration among MCA, MBMA and SPFA, preliminary research has already been done to evaluate the exothermic curing on metal. The next phase will include the use of full size wall and roof assemblies with foam sprayed in different ways. Results of the project will be used to generate a “Do’s and Don’ts” guideline for using spray foam insulation with metal wall and roof assemblies. As with all test standards, NFPA 285 is reviewed on a regular basis to address inconsistencies and technical issues within the standard. In March, an NFPA committee met and proposed changes to the wall construction for this test that will render many past tests invalid. The proposed modification specifically locates panel joints where they were previously required to be “representative of standard construction practices”. This modification will not only affect combustible exterior cladding, it will affect any wall assembly that contains combustible elements including insulation and barrier materials. The NFPA proposed modifications are currently open for public comment until November. During that time, MCA will work with NFPA to understand the reasoning behind this proposal and better define the level of impact. 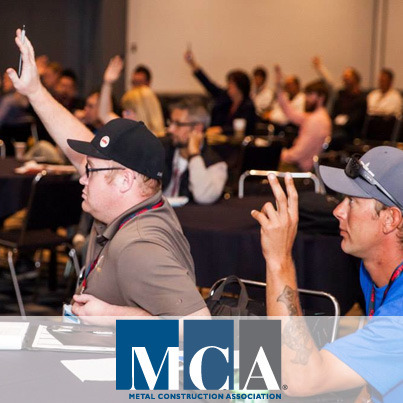 The Metal Construction Association assembled for their 2015 Summer Meeting in June where the various committees and councils discussed current trends and developments in the metal construction industry and how MCA is and should be addressing them. MCA’s advocacy is benefitting the industry. From lobbying participation with the Zinc Coalition to protect the market for galvanized steel and zinc products in Washington state – to support of the American High Performance Building Coalition’s efforts to oppose the adoption of California Proposition 65 – to having a seat in the High Performance Building Congressional Caucus Coalition advocating for the development of industry-based criterion for future standards, MCA’s presence and voice is shaping legislation that impacts the industry. NEW TECHNICAL BULLETIN JUST RELEASED! 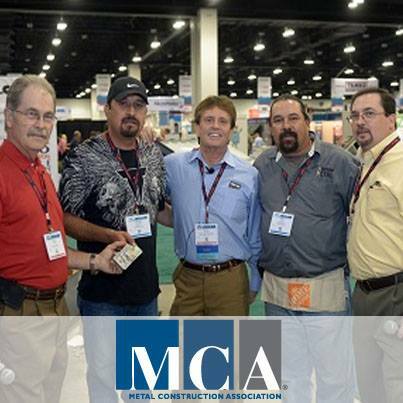 Non-members are welcome to attend an MCA event, at a special rate, to determine if membership is a good fit. The Summer Meeting is coming up June 2-3, 2015 in Chicago. The event will include council and committee sessions, plus socializing and networking – great opportunities to get more metal into building projects. 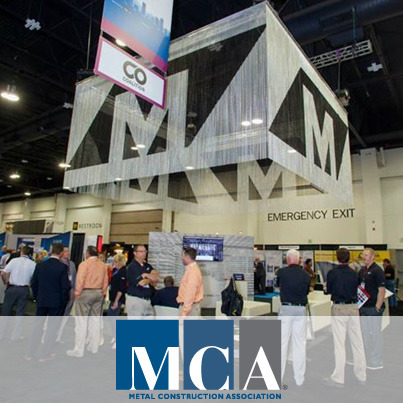 METALCON will take place October 14-16, 2015 in Tampa, with about 300 companies exhibiting and 8,000 architects, contractors, engineers, and building owners attending. Which event would you like to attend?